Jayanthi is a midwestern lady, having been raised in both Ford Heights, IL, and Minneapolis, MN. Her father is from India and gave her a name in his language that means Victorious One. She has been singing ever since she can remember. Jayanthi grew up singing with family and was always in a choir or two. She toured for a year and a half with a volunteer organization that sought to uplift people in schools, churches, juvenile detention centers, nursing homes, jails, and hospitals with music, skits, puppetry and improv comedy. 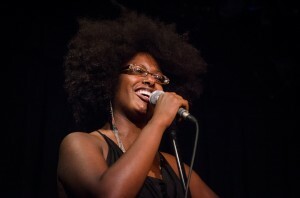 She now is the lead singer in a band called Black Audience , as well as five additional bands. She received a grant from the State Arts Board of Minnesota and successfully created and performed family variety shows in Minneapolis that reached more than 2000 people. Jayanthi has trained her voice to expand and fill large spaces. She has achieved a sound that commands attention and always respects that attention by offering selections that edify, inform, and engage the listeners. Jayanthi has a long performance history in the Twin Cities and is also passionate about presenting accessible vocal tools, basic music education, and performance opportunities for people. Jayanthi has seen her two sons and daughter respond deeply to tactile and sensory experiences including music and theatrical elements. She want to provide a quality context for people where they can participate and grow in learning how to work as a team vocally. She has learned that it is invaluable to raise voices together, as well as be able to carry an instrument inside yourself. Music grows our confidence in our ability to share our talents with others as well as ourselves. Jayanthi believes we cannot appreciate enough what children have to teach us, and she thinks it’s our duty to foster an environment for this exchange and encourage them to express themselves and their own unique gifts. Children know so much inherently, and Jayanthi wants us all to support them in areas like manners, respect, sharing, health, and joy. She believes music, storytelling, and music theory are great tools that children and adults alike can use to empower themselves.